A teacher seeking advice on how to broach Brett Kavanaugh’s contentious U.S. Supreme Court confirmation with his students sparked thousands of responses from fellow educators and observers on Twitter this past week. 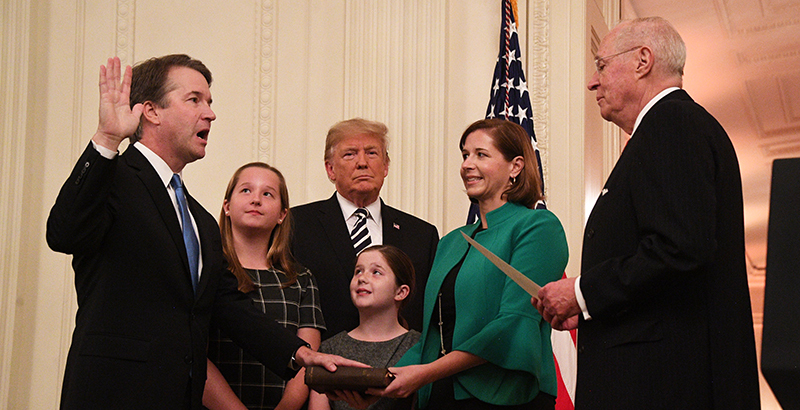 Teacher Nick Ponticello had been searching for the best way to facilitate classroom discussion on what he considers a “big moment” in American history: the nomination and appointment of President Trump’s newest associate justice — accused in mid-September of sexually assaulting a woman in high school — and the seething partisan battle that emerged, epitomizing the nation’s gaping political divide. The Senate narrowly confirmed Kavanaugh 50-48 on Saturday as throngs of protesters rallied outside the Capitol. But moderating talks on such a heated and complex topic is “tricky,” he said — especially when educators are expected to keep their biases at bay in the classroom. So he posted two tweets asking the Twitterverse for guidance: one on Sept. 29, two days after Dr. Christine Blasey Ford and Kavanaugh’s hearings, and another on Saturday, after the deciding vote. In the posts, he makes no secret of his own stance, asking if he should tell students “that this country doesn’t take sexual assault seriously? Do I tell them that truth and integrity don’t matter?” Ponticello identifies himself as an “educator” on Twitter. I’m a teacher, and I don’t know what I’m going to say to my students if Kavanaugh gets confirmed. Do I tell them that this country doesn’t take sexual assault seriously? Do I tell them that truth and integrity don’t matter? What do I say? I’m a teacher, and when Trump was elected, students were crying at my school. I didn’t know what to say then, and I don’t know what to say now that Kavanaugh has been confirmed. What do you tell a bunch of young hopefuls when the world cheats them of their futures? Please help! Together, the two tweets racked up more than 8,500 comments, 13,000 retweets, and 45,000 likes as of Tuesday afternoon. Feedback largely focused on teaching children about civic duty and encouraging them to vote. Other suggestions included holding a mock election, letting students lead discussions, and publicizing available resources for those who are struggling. Acknowledge that many are hurting, many have experienced sexual assault and harassment, and that you will be there for them and believe them and stand with them. Let them know how they can privately reach out to you to speak and resources that are available to them. As a teacher you already hold space for your students. Allow them to speak. Allow them to learn to use their voices. Tell them it’s ok to feel but each individual can make a difference. Perhaps ask what they would like to see happen in the government. Perhaps a mock election. Ponticello had already carved out class time in late September to moderate student discussion on Kavanaugh’s looming confirmation, and he had put the curriculum on hold Sept. 28 to stream the Senate Judiciary Committee meeting that spurred the reopening of the FBI’s background investigation. But the responses to his tweet generated some new ideas, too. The responses often mirrored the split in public sentiment during the Kavanaugh saga. Sylvia Chan-Malik, associate professor of American and Women’s and Gender Studies at Rutgers University, commiserated with Ponticello when she read his Oct. 6 tweet. She remembered being “scared” to face her students the morning after Trump won the 2016 presidential election. What Chan-Malik found helpful then and now is to remind students of other times Americans have persevered through moments of crisis. The conversation has been a little different for Chris Gubbrud, who teaches sixth grade social studies in South Dakota’s Mitchell School District. The students are a bit young, he said, to delve into topics such as sexual assault allegations — though he noted he and his class have talked about “how much past mistakes could potentially impact your life, and to be careful about the choices you make.” But he is using this moment to teach related topics, such as the importance of staying informed on current events and reading multiple news sources. I would suggest an unslanted view of government. No matter how you stand politically it is wrong to offer a bias perspective to students of any age. You are a critical figure in their lives, teach them how to see both sides and make up their own mind. Gubbrud emphasized in his tweet to Ponticello that regardless of the lesson, it’s never teachers’ job to inject their own opinion or draw conclusions for students. “At a divisive time in the history of the country, we have to make sure we’re giving kids a chance to think for themselves,” he said. I think it’s important to teach them that they’re going to lose more than they win. And that makes every little win even more important. Had the same..with third graders! I told them that it was good they had an opinion and that they should work hard to be educated, and work towards making the world a better place. Then we made posters promoting kindness around the school. Have no idea what to tell students even though I taught for nearly four decades, except that they must value their right to vote and to do it! 5th grade here, major red area, I teach children to respect others, the branches of the govt., and the power of the vote. Teach them that both sides cheat and lie – teach them that greed sadly wins! Teach them to do their research well before they vote and we’ll hopefully end up with a new system where everyone has to WORK and there are no handouts. Thanks for being a teacher – I am too! Taught H.S. & Col. journalism for 20yrs. Every generation has their call to action, mine was the immoral Vietnam war, & the civil rights movement. Tell your charges this is their call-to-action. Study those students fr Parkland school. The only way to fight defeat is to mobilize.